We English had a brief flirtation with republicanism in the mid 17th century when the roundheads chopped off Charles I‘s head. Alas, the experiment only lasted eleven years and Charles II was restored to the throne. Still for those of a republican disposition January 30th, the date when the regicide occurred, has a certain resonance and it is not surprising to find that a club was formed to keep the memory of that moment of republican spirit alive. 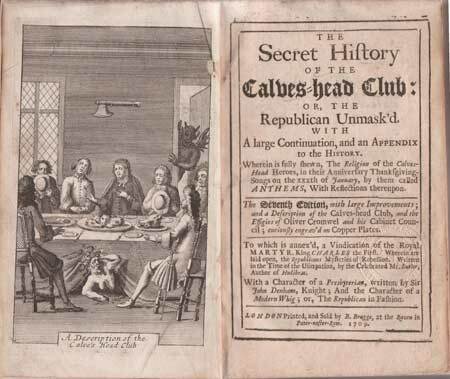 The Calves’ Head Club was just such an association. It is thought, although it cannot be proven conclusively, that it was formed during the Commonwealth (1649 to 1660) and the poet John Milton, whose Eikonoklastes was a justification of the execution, could well have been a leading light. What is clear is that the club had a rather elaborate ceremony replete with symbolism when they congregated for their annual meeting and dinner on January 30th. An axe was either hung from the ceiling or placed on the table, representing the instrument that delivered England from tyranny. The menu consisted of calves; heads, representing the king’s royal office and his supporters, a cod’s head representing Charles Stuart, a pike representing tyranny and a boar’s head, representing the king preying on his subjects. The club members drank republican toasts from cups made from the skulls of calves, their principal one being “to those worthy patriots who killed the tyrant”. After their meal they would go on to burn a copy of Eikon Basilike which was seen as royalist propaganda and swear an oath in praise of Milton’s retort. Naturally, the restoration of the monarchy caused the club some difficulties and the members had to keep their heads down, as a history of the club published in 1703 records , “after the Restoration the eyes of the Government being upon the whole party, they were obliged to meet with a great deal of precaution but now they meet almost in a public manner, and apprehend nothing”. The first definitive record we have of the Club meeting is in 1693 when the anthem for that year was published in their Anniversary Thanksgiving Songs on the 30th of January. Although in Queen Anne’s reign the club felt secure enough to become more open in their activities there still were grave risks and, indeed, a significant outbreak of public opprobrium against them in 1735 ultimately did for the club. According to contemporary reports, “Some young noblemen and gentlemen met at a tavern in Suffolk Street, called themselves the Calves’ Head Club….” They dressed up a calf’s head in a napkin, threw it on a bonfire and waved napkins dipped in red wine out of the window. Not unsurprisingly, this behaviour excited the interest of a mob who “having strong beer in them” staged what we would now call a demonstration outside the building. The mob’s feelings were further inflamed by the nature of the toasts being proposed by the Club members and eventually they “broke all the windows, and forced themselves into the house”. Damage caused ran into the hundreds of pounds and guards were stationed on the streets to protect neighbouring properties. The Grub Street Journal recorded some verses about the furore, “Strange times! When noble peers, secure from riot/ Can’t keep Noll’s(Cromwell’s) annual festival in quiet/ through sashes broke, dirt, stones, and brands thrown at ‘em/…/forced to run down to vaults for safer quarters/ and in coal-holes their ribbons hide and garters”. An ignominious end to the club indeed! Ever felt the time spent sitting on the carsey straining to produce a number two was rather wasted? Me neither, but stick with me. 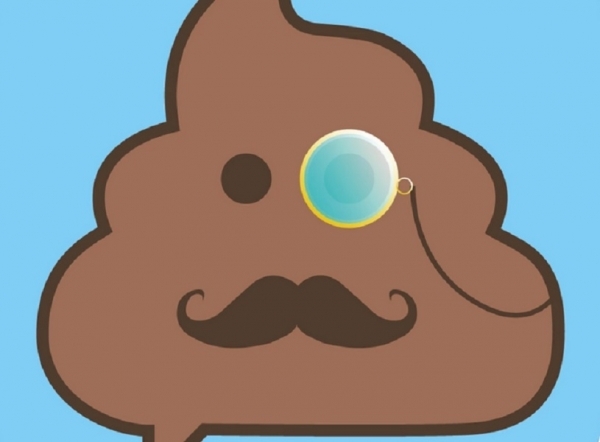 For those who do, help is at hand with an app which came to my attention this week called Pooductive. Apparently, using location services, it links up users who are sitting on the bog with others in a similar position world-wide. You can then exchange messages either one-to-one or anonymously and, I presume, exchange pictures. I looked for an Android version in order to road test it but it is only available as an iOS app. Why anyone should feel the need for this sort of app is beyond me. What’s wrong with an old-fashioned newspaper or a book if you feel the need? Art should provoke a reaction but perhaps it shouldn’t be quite as extreme as punching a hole in the canvas. But this, it seems is what a 12 year-old Taiwanese lad has done to Paolo Porpora’s inoffensive Flowers, valued at around £1 million. Of course, he is claiming that all he was doing was walking past the picture and he caught his foot, stumbled and in an attempt to break his fall put his fist through the canvas. A likely story! One of the most feared diseases to strike the United States and for which the cause was a complete mystery at the time was yellow fever. Of course, we know now that the fever was transmitted by mosquitoes and the spread and the rapidity with which it travelled was a consequence of improved communications, particularly between the Caribbean areas where the disease was endemic and the eastern United States where it wasn’t. Infected mosquitoes would travel over on ships and feast on the flesh of people who had no immunity to the disease. The symptoms were terrible – it got its name from the jaundiced colouration of the skin of a victim – vomit that was black and was the sign that your end was nigh, bleeding gums and noses, stomach pains, tarry stools, severe headaches and a temperature that hit 105. Because the cause of the disease was unknown, the symptoms so extreme and your chances of survival so poor, the very mention of a yellow fever caused panic and hysteria. In 1878 the conditions for a major yellow fever outbreak were optimal – the unusual climatic conditions were ideal for an explosion in the number of mosquitoes and the aftermath of the war of independence in Cuba (from Spain) meant a larger influx of refugee from areas prone to the fever than usual. To minimise the disease’s potential impact our old friend the quarantine was introduced to control shipping coming into New Orleans. But, of course, a quarantine is only as effective as the diligence of those who enforce it. When the steamship Emily B Stouder pulled into the quarantine station on May 23rd there were no reported cases of the fever in the States. The quarantine doctor noticed that the purser, Clark, was ill but put it down to neuralgia and a hangover. Inevitably, Clark had yellow fever, was dead by the 25th and that was all that was needed for the fever to gain a foothold on the mainland. News that the fever had hit New Orleans caused panic and around a fifth of the population up sticks and left, inevitably taking the fever with them. 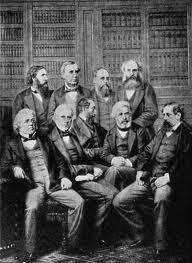 Many of those who were left succumbed to the disease and the doctors, whose futile attempts to cure them with bloodlettings, carbolic acid and doses of quinine, were worse than useless. An epidemic was declared on August 10th when there had been 431 reported cases and 118 deaths. The railway system facilitated the spread of the disease and maps of outbreaks and their timing show its inexorable journey along the main railway and transportation routes of the Mississippi region. The first recorded death in Memphis was that of Kate Bionda on August 13th. Kate was a restaurant owner and contracted the disease when an infected man visited her gaff. As with New Orleans news that the fever had reached Memphis caused panic and around 25,000 of the 47,000 fled the city, travelling to rural areas or places away from the river. Train tickets were at a premium – the superintendent of the Louisville and Nashville railroad reported that between August 12th and 16th tickets were selling for the modern-day equivalent of $750,000! Inevitably, many of the fleeing residents took the disease with them, outbreaks being reported as far away as Kentucky, Indiana, Illinois and Ohio. Some towns would accommodate the refugees whilst others set up gangs of armed men to enforce their local quarantine arrangements. It was only the arrival of the autumnal frosts which killed off the mosquitoes that ended the epidemic by which time around 20,000 had died. One of the unanticipated benefits of being forced by the recent tube strikes to forsake my normally troglodytic mode of transport for a tramp across the mean streets of London is having the opportunity to (re)acquaint myself with some of the landmarks of our metropolis which, otherwise, would pass me by. What particularly caught my attention was a splendid edifice on Southwark Street called the Hop Exchange, now a venue for corporate entertainment. Hops are a staple ingredient of English ale, giving it its distinctive bitter taste and acting as a preservative and antibiotic. Kent was the principal area for growing hops and the only land route into the metropolis until as late as 1750 was via Borough High Street and over the old London Bridge. Inevitably, Southwark, handily placed on the south side of the Thames, became the epicentre of the hop trade and until the early 1970s there were many hop factors and merchants operating there. Even in the railway age trains conveying hops would terminate at nearby London Bridge station. The hop factors used their showrooms to display their wares, usually in the months of February and March, and the hops would be bought by hop merchants who made their purchases on behalf of their brewer clients. April was the month for the settlement of accounts. Warehouses were substantial and following the development of Southwark Street in 1864 the largest hop merchants, Wigan’s, commissioned a local architect, R.P Pope, to build a warehouse at no 61 capable of holding 10,000 sacks or pockets of hops and space for four wagons to be unloaded simultaneously under cover. Even that wasn’t enough and when the Hop Planters’ Joint Stock Company went bust in 1868 they took over their premises at no 15 and extended it towards the Charing Cross railway viaduct. To give you a sense of the trade, annual crops regularly reached between half and even three-quarters of a million hundredweights. 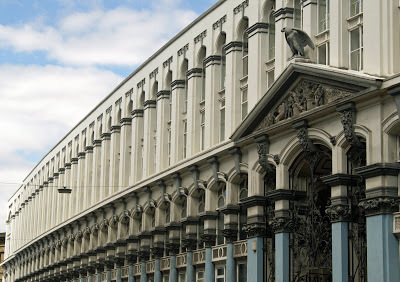 The Hop Exchange, which is at no 64, opened in 1868 provided hop dealers with a single and central trading forum. The enormous glass roof was designed to enable trade to be conducted with the considerable benefit of natural light. According to near-contemporary reports, “the hall is approached by a short flight of steps and a vestibule with large iron gates. The business of the Exchange is transacted on the ground floor, while all round and in the three galleries are the offices of merchants and others”. Unfortunately, on 20th October 1920 fire broke out at the Exchange, destroying the roof and upper two storeys which were never replaced. The building then sustained significant damage during the Blitz and whilst the restoration is sensitive and the building impressive, retaining the sweeping curve that made the original vaguely reminiscent of the Coliseum in Rome, it has lost the majesty and grandeur of the original. Above the main entrance is a statue of an eagle but more germane to the building’s history are the three carvings on the tympanum of the picking and transportation of hops. Judging from the publicity shots of the interior the galleries and the central open space where the trading was transacted are extant, making the building a fascinating reminder of a vibrant trade that was conducted there. In a Desert Island Discs moment – cue sound of herring gulls and Eric Coates’ In a Sleepy Lagoon – I was asked what my favourite book was and without hesitation I nominated one of Elizabeth Gaskell’s North and South and George Eliot’s Middlemarch. I then paused for thought and concluded that there were so many literary genres that it was difficult to put one style above another. 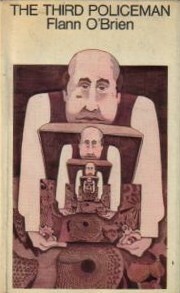 Without doubt, one my favourite comedic writers is the Irishman Brian O’Nolan aka Flann O’Brien and Myles na Gopaleen. It was probably a combination of this rather innocent enquiry, my fulminations on Susanna Clark’s use of footnotes and my pontifications on Epicurean atomic theory that persuaded me to pick up The Third Policeman again, a novel I hadn’t read for some thirty years or so. It was submitted for publication in 1940 but timing was against it – there was a war on, don’t you know, although not in Dublin, and Joyce’s Finnegan’s Wake had probably banjaxed the publisher’s zeal for surrealistic works of Irish humour – although this book is a different sort of pancake altogether . It didn’t see the light of day until 1967, a year after O’Brien’s death, an age more in tune with this dark exploration of the life, death and the inner soul, called Joe. The twists and turns and surprises along the way are best left to the individual reader to discover. Suffice it to say that the book starts out with a brutal murder by the unnamed narrator who has a wooden leg, a key attribute as the story unfolds, and his accomplice, John Divney. The narrator returns for the murdered man’s box of goodies but then enters into another world where geometry, time, space, distance, physical laws are all to sea and the custodians of this other world are three policemen whose primary concern is bicycles and the theft thereof. The plotting is so dense and dramatic that you feel that you are reading a much longer book than its 200 or so pages. Much of the book’s humour is to be found in its footnotes which must be read in which we explore the lunatic world of the cod savant, de Selby, held by many to be a nincompoop. De Selby hit upon the idea that if he locked himself in a room with a quantity of picture postcards and instrumentation that could alter atmospheric and climatic conditions, he could travel to Folkestone and back without stirring. Noticing that light takes a fraction of time to travel, he theorised that by constructing a series of properly aligned mirrors the viewer would see into the past -wonderful and in the context of what is happening in the narrative of the book almost logical. A central conceit of the book is that atoms transfer from a bicycle to its rider and the policemen mount a bicycle crime-wave to reduce bicycle usage amongst those whose level of bike atom transfer is deemed to be too high. Is it about a bicycle? No, much more than that and a true classic. When I was at university a contemporary of mine, now an eminent Classics professor at a major American uni, decided that for his PhD he would use the new-fangled computer technology to analyse the texts of Homer to nail once and for all the question of whether the Iliad, Odyssey and the Homeric hymns were written by one hand or not. You have to remember that some 40 years ago the amount of computer horse-power required to conduct such an analysis would have comfortably filled a large room, there would have been lots of whirring of drives, perhaps a little steam, and then miles of printed output on that curious light green and white striped perforated paper with holes running down each side. Inevitably his findings caused some controversy at the time and weren’t universally accepted. For me it seemed a rather perverse line of enquiry to pursue and a questionable use of doubtless expensive and scarce computer resource. To ponder whether Homer was one person or a collective is a mildly entertaining academic past-time and can usefully occupy you at a dinner party in that time between the port running out and the coke being passed round but it misses the real point. What is of principal interest is whether it is good poetry and to appreciate the way the composer handles language, their style, their use of imagery, what can be gleaned about the socio and political context of the time, understanding their cosmology, theism, the role of man in the world etc etc. In comparison who wrote the damn thing is about as interesting and, dare I say it, as relevant as knowing the engine make of the tube train I’m travelling on as I write this. My thoughts travelled this direction after reading a news report that song analysts Musixmatch, after analysing 99 best-selling artists across 25 musical genres, reported that Eminem used 8,818 different words in his 100 most lyrically dense tracks. The next three places were also taken up by rappers – Jay-Z (6,899), 2Pac (6,596) and Kanye West (5,069) – whilst the icon of 60s liberalism, Bob Dylan, weighed in in 5th place, using a paltry 4,883. My musical taste is pretty catholic – I like my music to be challenging, provocative and with something to say – but, probably because it is an age and cultural thing, I’ve never really got on with rap. After Grandmaster Flash’s Message it went downhill for me but one thing I know about the genre is that it is characterised by a stream of words coming from the rapper. It is mildly interesting, but perhaps not altogether surprising, that the pre-eminent practitioners of this musical style use a wide vocabulary. However, the underlying message from the study, or at least the way its results were portrayed in the press, is that use and range of vocabulary equates to poetic genius ergo Eminem is significantly more accomplished a poet than Dylan. Again, an interesting discussion for a dinner party for sure but a line of argument that falls into the trap of my Homeric friend. The hallmark of good poetry is use of language rather than diversity of vocabulary. A good poet can paint an image with very few words, by allusion, by reference, by making the reader (or listener) work on a reference. Often superficially simple poems with a limited range of vocabulary can be the most effective. Indeed, the counter argument can be made – the more words deployed, the less effective the poet. Either way the study is another fatuous use of computer horse-power but at least it allowed me to wander back down memory lane.